MILWAUKEE, Harness high-performance power with the new Screamin' Eagle Variable Pressure Clutch (P/N 37000121, $289.95) from Harley-Davidson Genuine Motor accessories. 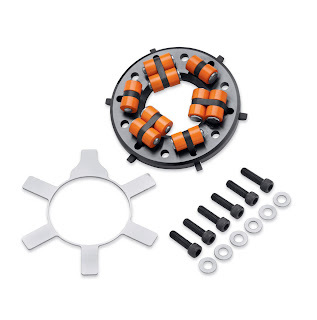 Designed to enhance the performance of an Original Equipment clutch, this bolt-on kit uses the centrifugal force of spinning weights to apply increasing pressure to the stock clutch pressure plate as RPM rises. Peak clutch tension is increased from 120 ft. lbs. to 153 ft. lbs. without increasing clutch lever effort at idle. The Variable Pressure Clutch also provides smoother clutch disengagement at lower speed. This kit fits 1999-later Evolution 1340 and all Twin Cam-equipped models behind most stock derby covers with no modifications. Some covers may require a spacer kit. See an authorized Harley-Davidson dealer for fitment details.